Damien Hirst first came to public attention in London in 1988 when he conceived and curated Freeze, an exhibition in a disused warehouse which showed his work and that of his friends and fellow students at Goldsmiths College. In the nearly quarter of a century since that pivotal show, Hirst has become one of the most influential artists of his generation. 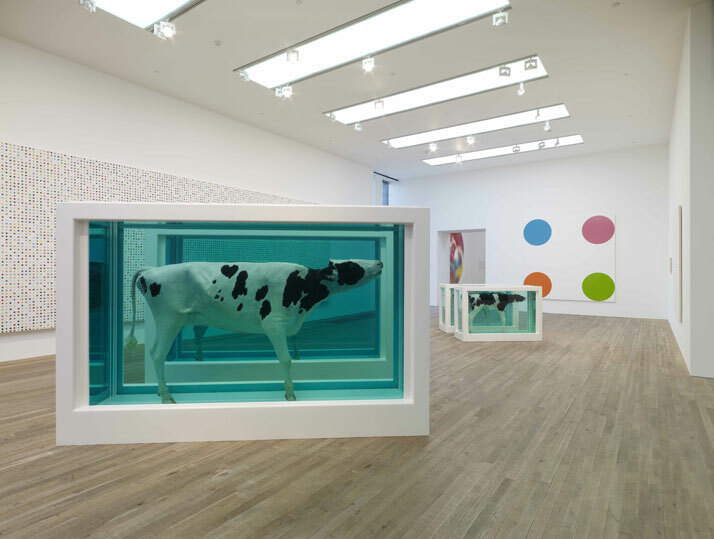 Chelsie: I am desperate to visit the 'Damien Hirst Retrospective Exhibition' as this will include all of his works, from his earliest creations to his most controversial over the last two decades. It is Hirst, whom turned the old age notion of being a skint aritist suffering for thier art around, becoming a household name and in turn as wealthy as the actors, rock stars and heirs he parties with. 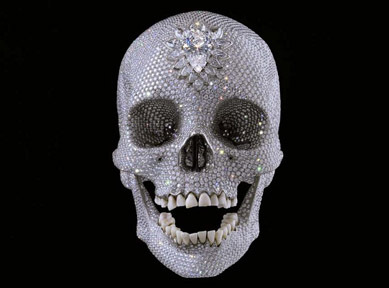 Hirst is truly an heir to the Warholian dream. To create Hirst's works money is needed from the slaughter and shipping of animals, to the creation of tanks that house them. 'For the love of god' his most expensive and flashiest work, throws his wealth in our face as it encapsulates all that he's about death and decay what remains when the flesh is gone. Yet we are removed somewhat by what the true iconography of a skull is; as he turns a garish motif into a symbol of status with natural products that are meant to last forever. Beauty within nature is also an evident theme. In Hirst's butterfly works, from his mosaics formed with the wings of the deceased to the butterfly room in which the insects emerge from their cocoons to flutter, fly, get drunk on fruits and then die they are essentially reborn to die. The Calves, cows & sheep suspended in time & space could be remembrance of their existence as is a reminder that we to will be somewhere calm & clear with only a grave stone or urn to celebrate what we was. Possibly the point of repetition is that Hirst's work is repetitive, ideas that are one long extension and series all around the same themes of death, decay preservation, religion and wealth. The human condition and all we hope for yet also all we fear allowing beauty to be found in the unsettling. Verdict- Intriguing at best to see one of the worlds most famous artists work from the past two decades rounded up and allow a cohesive insight into his world there is a clear sense of direction within Hirst's ideas, concepts and artworks which shows evidently and allows for a precise conversation. Love or Loathe Damien is clearly a very smart man and has something to say whilst impacting, dividing and changing the contemporary art world in the process.